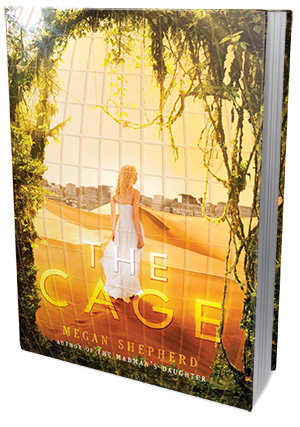 I am thrilled to be a stop on the book tour for The Cage by Megan Shepherd hosted by Rockstar Book Tours! Today, I have a review for your reading pleasure, but be sure to check out the tour schedule below, or click the banner above, for more! They set off down a path made of a material that looked like pavement but felt softer, almost spongy, through a meadow of tall grasses. It was all uncannily beautiful, but that only set off Cora's nerves. Beauty had a way of masking something darker. She wanted answers. Why had he saved her from the Warden. Why she got more tokens than everyone else. If all humans felt a spark of electricity when he touched them, or if it was just her. Her shaking fingertips coiled into her palms, making a tight fist against the panel. In her dreams, she thought he was an angel. A beautiful face to chase away the nightmares. He was beautiful. But instead of taking her away from nightmares, he had brought her into one. It was no longer an order. It was a request, and one of the few times Cora had heard his voice sound anything other than mechanical. "I'm not the only one watching you," he said. "I cannot protect you forever." He slumped against the bed, moaning. Tears spilled from her eyes as she held on to him and murmured apology after apology, hating what she had done, hating the Kindred for making him into this twister person. There's an old Twilight Zone episode that I love ("People Are Alike All Over") that deals with this topic - people zoo! - and after I read the synopsis for The Cage I knew I had to read Megan Shepherd's take on this. The story is told mostly through Cora's perspective, but we do get a few chapters from the five other captives (Lucky, Rolf, Nok, Lean, and Mali). Cassian soon introduces himself as a member of the Kindred, "the most advanced among the intelligent species and as such, take responsibility for overseeing lesser races," like humans, and have taken these individuals as they posses qualities the Kindred find desirable. After learning that they have indeed been abducted, and only have about 21 days to bang it out or be "relocated," Cora decides she is going to escape. Which is where I have my biggest issue with The Cage, along with my love/hate toward Cora herself. Cora, having just been released from juvenile detention, has had enough of being held prisoner. She attempts to enlist that help of the others, with only Lucky being her supporter. I completely understand not wanting to live in an alien zoo and having the desire to go home, but where are you going to go? How are you going to get home? You're not in the depths of a jungle in Africa, you're on an alien planet. There is a bit of downtime throughout the plot. Things aren't really happening but the reader, along with our characters, are getting used to the world and their new existence. The Cage definitely reads like first novel in a series, but while there is a lot of "wandering around," the plot doesn't feel long and drawn out. I wish I could go more into detail about this but I don't want to spoil things for you and, despite lack of action, there are a few rather interesting aspects that I loved being surprised by. In all honestly, I was nervous throughout reading this book because it's a trilogy and I didn't want to read three books of these people being stuck in their cage, Cora trying to escape, and everyone else telling her to just deal with it. But oh buddy, that ending! The ending blew me away - it was amazing! So while The Cage does have it's moments where the plot seems drawn out and you're just waiting for something to happen, it's all worth it once you get passed that halfway mark and you're itching to get your hands on book two! Megan Shepherd grew up in the mountains of Western North Carolina, where her family has owned and operated an independent bookstore for over 35 years. Shepherd attended the University of North Carolina at Chapel Hill, where she majored in international studies and went on to live and work in Costa Rica, Senegal, Scotland, Spain, and many other countries. Now, Shepherd has returned to Western North Carolina and is a full-time writer of young adult novels. She is represented by Josh Adams of Adams Literary.